Additional options are available for your car. 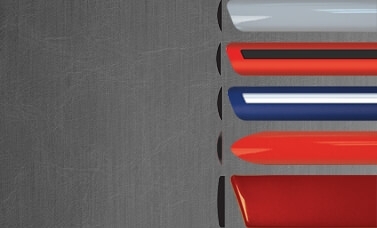 Need a custom set of car door moldings but don't want the hassle? We understand! That's why our moldings are made and painted specific to your year/make/model and vehicle body type and delivered to your door ready for an easy installation. The best part is - the moldings are made, painted and shipped extremely fast - usually within 2 business days. These moldings will help keep your door from being on the receiving end of obnoxious grocery shoppers, careless car exits and other life mishaps! 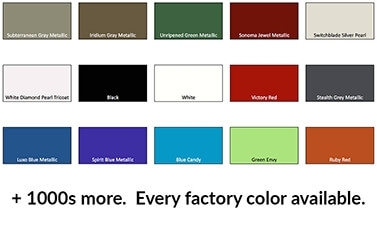 Our painted door molding sets are guaranteed to match your factory paint. 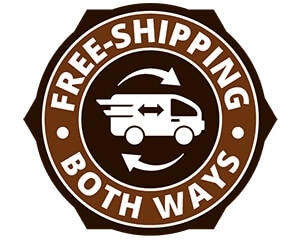 If you cannot locate your code when ordering, select the "Other" option - we will email you within 4 business hours. See below for information on how to find your paint code. This 4 piece door molding set is a great alternative to factory moldings, a perfect way to upgrade your vehicle's trim package. Protects against door dings, nicks and scratches. 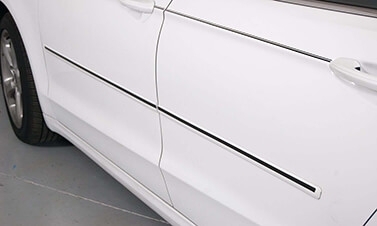 Your car door molding set is designed to be installed at the crown (or apex) of your door so that it's ready to protect your vehicle at its most vulnerable point. Although it's up to you where to install it, we highly recommend installing it at the most vulnerable point for maximum protection. This door molding set comes as a 4 piece set, 1 piece per door. For coupes and other 2-door vehicles, it includes 1 piece behind the door. Your molding pieces will come with 2 strips of strong 3M adhesive already applied to the back of each molding. No drilling & no mess - the 3M adhesive strips make this a really easy installation. Just make sure to follow the installation instructions (included)! 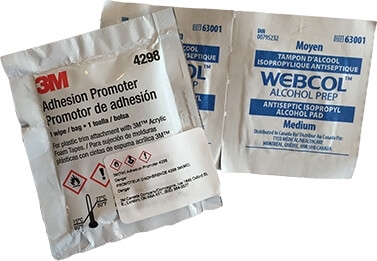 Everything you need to install is shipped with your moldings - alcohol wipes for clean & prep, adhesive promotor for a stronger attachment, and an adhesive strip along the entire molding. We'll even email you a copy of the instructions ahead of time, so that you're ready and prepped for an easy install! Your new molding set will arrive at your doorstep ready for an easy installation. All moldings are painted to order, with 2-3 base coats and 1-2 clear coats, and usually ship within 2 business days. 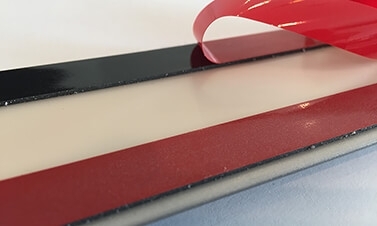 Our car door moldings have become extremely popular with dealerships nationwide for one reason - they are perfectly sized to fit your vehicle, are painted to match and are ready to install as soon as you receive them. This is the perfect side door molding option for "do it yourselfers" and dealerships looking to add some value and style to their vehicles. This 4 piece set comes color matched to your vehicle and ready to install in 30 minutes or less - all necessary adhesive promoter, adhesive and alcohol wipes will be included. Returns: Because these moldings are custom manufactured to order for your specific vehicle and paint color, this product may not be returned for refund. If your painted product is damaged during shipping, you may return your order for an exchange. Damaged orders must be reported within 3 business days of delivery. These moldings are completely custom, which means they aren't designed to replicate or emulate your factory molding set. If you have molding currently installed, you will need to completely remove your current molding set and determine what molding width you'd like - 1.25" or 2". These molding sets will likely have different dimensions than your factory or other aftermarket set. You will need to remove all current moldings if you want a matching set; none of our pieces will match any of your existing moldings, unless you've previously bought a set from us. For this reason we do not sell single pieces. Available for nearly every make & model on the road, these moldings are the best and quickest solution for your vehicle. Help! Where do I find my paint code? In nearly all cases you can find your paint code in the driver's side door jam or in the glove box on a sticker. If you want to go ahead and order, simply choose "Other/Not Listed" and we will contact you within a few hours and provide assistance in locating it. Or, you can contact us prior to ordering. Let us know the year/make/model of your vehicle and we'll show you exactly where to find it. This molding set comes with a lifetime warranty. Excludes normal wear and tear.